A smart and swoony debut novel for fans for Stephanie Perkins and Jenny Han. Sophia Wachowski has seven days left in Tokyo before she moves back to the States for her senior year of high school. 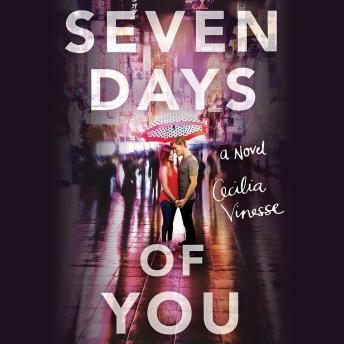 Seven days to say good-bye to the electric city she's called home for years, to eat at every ramen shop she can find, to sing endless karaoke with her wild best friend, and to finally tell her crush she's in love with him. Seven perfect days....Until Jamie Foster-Collins moves back to Japan and ruins everything. Three years ago, Jamie left for boarding school in the States, but not before he crushed Sophia's heart, and she hasn't spoken to him since. Now the last thing she wants is for him to steal her leaving thunder with his stupid arriving thunder. But hating Jamie is a lot harder than it used to be. For starters, he's a lot less awkward than she remembers...and a lot cuter. And as the relationships she thought were stable begin to explode around her, Jamie is the one person left for her to lean on. Sophia is forced to admit she may have misjudged Jamie, but can their seven short days of Tokyo adventures end in anything but good-bye? A funny and poignant debut novel filled with first kisses and second chances.